China and Japan held their first high-level economic dialogue on Monday after a hiatus of eight years, signaling renewed cooperation in high-end manufacturing and the service sector amid a pending trade war between China and the US. 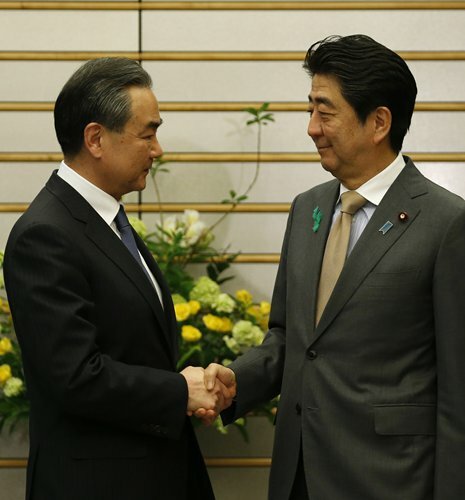 Chinese State Councilor and Foreign Minister Wang Yi and the Minister of Foreign Affairs of Japan Taro Kono jointly presided over the talks along with officials from both governments. Wang told the meeting that bilateral economic cooperation is at a new starting point, facing new historic conditions and macro environment. The two sides should deepen communication from both strategic and pragmatic perspectives to boost mutual understanding, accumulate mutual trust, promote coordination and enhance cooperation, said Wang. Kono said that economic cooperation is an important foundation and driving force for Japan-China relations. Japan attaches high importance to the important messages sent by Chinese President Xi Jinping at the opening ceremony of the Boao Forum for Asia Annual Conference 2018. In the face of rising protectionism, the free trade system centered on the World Trade Organization (WTO) should be safeguarded and trade issues should be handled according to WTO rules, Kono added. With China-Japan trade and economic cooperation entering a new era, the second and the third largest economies in the world need to communicate policies and measures, experts noted. Amid an improvement in bilateral relations, this is a good opportunity for the two countries to carry out further economic cooperation and for Japan to join the China-proposed Belt and Road initiative, said Chen Zilei, deputy director of the National Association for the Japanese Economy. "Japan's struggling economy and slow progress in Japan-US economic dialogue makes it urgent for the country to explore new markets. And China is undoubtedly a thriving one," said Shen Minghui, secretary-general of the Center for APEC and East Asian Cooperation with the Chinese Academy of Social Sciences. If the two countries can reach new consensus during the talks, it would bode well for future negotiations on a Regional Comprehensive Economic Partnership and a China-Japan-South Korea free trade agreement, Shen told the Global Times, adding he expects an outcome this year. China and Japan's economic cooperation has shown upward momentum since the leaders of the two countries reached a significant consensus on improving bilateral relations in November 2017, Chinese Minister of Commerce Zhong Shan said Sunday during a meeting with his Japanese counterpart Hiroshige Seko in Tokyo. Bilateral trade between China and Japan exceeded $300 billion in 2017, with Japanese investment in China rebounding, and Chinese investment in new economic models in Japan such as cross-border e-commerce, mobile payment, and the sharing economy also increasing, according to the Ministry of Commerce website. As of January 2018, China remains the second-largest export destination and Japan's largest importer. People-to-people exchanges were also on the rise, with the number of tourists to Japan from the Chinese mainland reaching 7.3 million last year, up 15 percent year-on-year. With the adjustment in China's industrial structure along with new measures for continuing reform and opening-up, the two country's industrial cooperation is changing shape. "Japanese investment has shifted from manufacturing to services, but now has moved to high-end manufacturing. Meanwhile, Chinese companies in the internet and sharing economy sectors are rushing to enter Japan, represented by Huawei and Alipay," Chen said. Looking ahead, experts said the two countries have potential cooperative opportunities in the services, advanced manufacturing and innovation sectors. Wang listed a number of areas the two countries should work on to upgrade bilateral economic cooperation, including energy conservation, environmental protection, science and technology innovation, high-end manufacturing, finance and banking, the sharing economy, medical and elder care industries. With China upgrading its education and healthcare, Japan can expect to enjoy more economic spillover through China's opening up, Shen said.